HoloLens was the most dazzling tech demo I’ve ever experienced—but it left me wanting more. HoloLens did much more than I expected—but made me question whether real people will actually use it in all the ways Microsoft imagines. HoloLens felt far less isolating and restrictive than the DK2 Oculus Rift headset—but I still felt trapped inside a piece of alien technology. And, yeah, strapped down tight, HoloLens wasn’t comfortable to wear. The pressure on the bridge of my nose was intense. It left a funny taste in my mouth. I collected all these experiences during a brief press demo at Build 2015 on Thursday night. 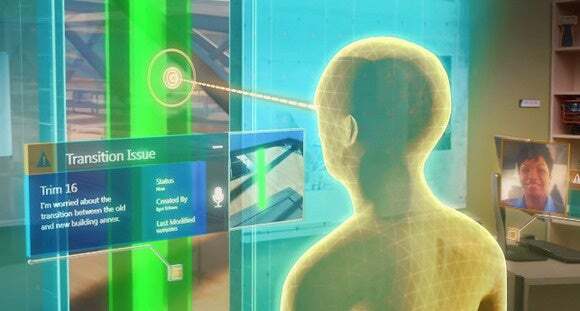 You can read all about how Microsoft uses advanced sensors to project holographic images onto the user’s environment here. But if you just want to know what HoloLens is like to use, follow along and I’ll regale you with a tale of high-tech trippiness that everyone should experience at least once. 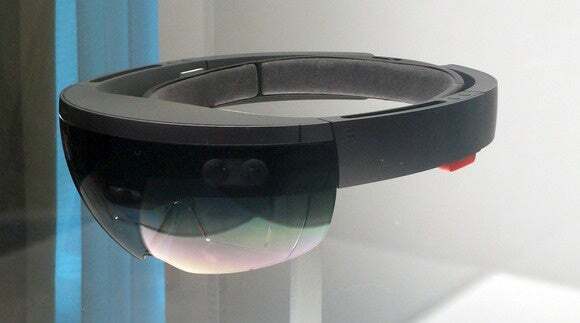 Journalists were allowed to photograph HoloLens behind a glass case. And then all recording equipment was confiscated before the actual demo. I feel like Richard Dreyfuss at the end of Close Encounters when he’s suited up and marching toward the alien mothership. The physical Trimble maquette as it appears in the HoloLens demo video. This is basically what the model looked like during my real-time demo. Microsoft also amps up the intrigue by requiring us to put all recording devices in lockers. Are they actually concerned about uncontrolled photography, or just looking to heighten intrigue further? If the latter, kudos. Because who remembers Apple Watch now. I enter the hotel room. I’ll be experiencing the Trimble demo. It’s a software package that helps architects envision how their designs will appear in the real world in a much more vivid, palpable, actionable way. Front and center in the hotel room is a small-scale physical model of a building. I love small models of buildings! And tonight I learn they’re called maquettes. Two Microsoft employees serve as my trip advisors. Their patter is cheery and scripted. They can’t answer technical questions. I am not allowed to place HoloLens on my head myself. Instead, my peppy new buddy lowers it onto my head, and then I grab and push down on HoloLens’ two arms to establish a snugger fit. The maquette with a holographic overlay. Again, this shot is from the controlled video. What I saw during the demo was drastically less detailed. But there’s one last step. My pal tightens up HoloLens even more with a twist of an adjustment wheel at the rear of the headset. I feel like the apparatus is being screwed into my head. I might be experiencing what the Mayans felt during humankind’s earliest brain surgery. I briefly consider the Mayans also did peyote. And now I’ll be doing HoloLens. There’s some parallelism here. The headset is super-tight against the bridge of my nose. It provokes a funny taste in my mouth. But soon the trip begins, and I’m transported into augmented reality. With HoloLens active, the Trimble maquette comes alive with a holographic overlay. It’s bright. Color is vivid. Resolution isn’t bad for this particular task at hand—I’m guessing 1024x768-ish, maybe 1280x1024-ish. It doesn’t look as high-res as what appears in Microsoft’s published HoloLensTrimble video, and the modeling throughout my demo isn’t as detailed as what appears in that video’s walkthrough. But the sum-total effect is still breathtaking. Using the mouse of a nearby PC, I can cursor directly from the PC’s real-world display to the hologram image on the table nearby. The cursor flow from flat display to the 3D hologram is seamless. I click on the top of the holographic building and drag my cursor—I just added a few floors. All the building tops are active. Another still from the controlled Trimble video. You can seamlessly flow from desktop PC to hologram. The holographic maquette is an adjustable 3D model, and aside from the pressure on the bridge of my nose and the sheer first-time trippiness of using HoloLens, manipulating the experience feels relatively natural. I’m not sure I could wear the goggles for more than 15 minutes without begging for a breather, but for this brief snippet, I’m smitten. But here’s the money shot: A street-view icon, much like you’d see in Google Maps, appears on the holographic maquette. It’s located on a pedestrian path. I click and voila: Through HoloLens I can see what my surrounding environment would look like were I standing there, right there. I’m still reeling from the trip, but this appears to be panoramic photography, not 3D modeling, projected everywhere around me. I look to the left and see buildings. I look down and see snow at my feet. It’s sharper and more vivid than anything I’ve experienced with Oculus Rift DK2. And it’s much less disorienting, because HoloLens isn’t a completely enveloping experience. The holograms are overlays, and I still feel oriented in a real-world environment. Here’s the controlled shot of extruding a roof top. Again, I didn’t see this level of detailing. Unfortunately, I didn’t take the brazen step of extruding the building top by another 15 stories, jumping up to the roof, and looking at my environment from there. But presumably I could have. The whole point of the Trimble experience is to give architects a vivid picture of the impact of their design decisions, and how small adjustments can affect sight lines and even more utilitarian structural considerations. Those more mundane considerations are explored in part two of my HoloLens experience. I walk into a separate space in our demo room. It’s built out with two fake walls that meet at a 90-degree angle. 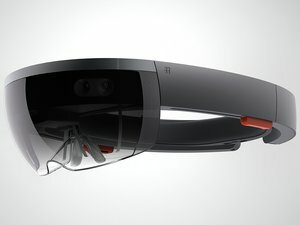 Microsoft says HoloLens doesn’t require any environmental markers or tags to trigger the holograms that pop up in your field of vision. But nonetheless the wall soon comes alive with a holographic schematic of all the beams and piping behind the finished veneer. My handler tells me the “room” is a work-in-progress. Architects still have design decisions to make. But wait! Someone has left a holographic note for me. There’s only one way to read it, and the trigger is very precise: I hold my hand about 18 inches from my chest, and click once—please, only once, I’m told—with a deliberate up-and-down motion of my index finger. OK, this video shot was nothing like what I experienced, except for the look of the green beem, and the lack of humility of the featureless avatar. The experience continues to feel relatively natural, all the sheer newness of HoloLens notwithstanding. A crude holographic avatar—he’s low-res and naked—leaves me a message about sightlines through the windows of the wall. (Or at least that’s what I remember by the time I’m back to full, non-augmented reality. Taking notes with pen and paper is all but impossible when you’re HoloLensing out.) I can see the entire wall in holographic cutaway. I can see the cityscape beyond, all in the same photorealism of my earlier street-view experience. HoloLens continues to be a dazzling high-tech trip. I complete the journey by leaving my own holographic note. Clicking a holographic hotspot, I leave an audio message for my architect friend: “That pipe is in the way!” An index finger tap lets me hear the message I left. Audio is clear through the HoloLens earpiece. I click again, and my handler congratulates me for being the only person to click a second time. I’m pretty damned proud, because my group of eight Hololens reality travelers is the last of Build 2015. The trip is over. My handler helps me remove HoloLens, and the bridge of my nose enjoys the release. As I come back down to earth, I don’t feel the same degree of what I’d call “reality phase-shifting,” from real-world to virtual to real-world again, like I have with Oculus Rift. HoloLens is weird. It’s alien. But it’s not over-the-top isolating. I didn’t feel I needed to submit to it, like I have with Oculus. And to be sure, the sheer surprise-and-delight factor of holographic augmented reality is off the charts. But do we really want so much other-worldly sensory overload? My Trimble demo was designed to show how real-world professionals can use augmented reality in a relatively utilitarian enterprise setting, but I can’t see an architect using these goggles for big chunks of a workday. HoloLens is still too heavy, still too tight on the noggin, and (apparently) still too sensitive to just toss on and off at will. What I experienced also didn’t match the resolution, polish and model detailing that we saw on the Build keynote stage, or what’s been portrayed in videos. Still, as a raw technology demo, HoloLens is fascinating. It sounds like hyperbole, but it really is a trip into a new dimension. It might have given me a funny taste in my mouth, and I can still feel residual pressure on my forehead, but I’d also like 15 minutes more.